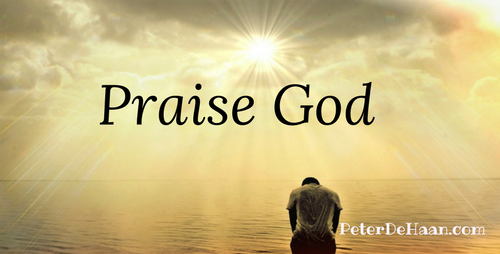 God's Worthy of Praise:The Bible flows with praise to God. What about us? The word praise occurs in more than 360 verses in the Bible. Most of these refer to praising God. They tell of people who praise God and their need to do so. Consider the short, six-verse Psalm 150. It’s filled with praise. The word occurs thirteen times. In fact, 15 percent of the words in the Psalm are the word praise. That’s a lot of praise. Psalm 18:3 reminds us that God is worthy of our praise. And it’s a good reminder. At least it’s a reminder I need. Though I talk to God daily, and on some days more than others, our conversation sounds like a monologue with me asking for stuff. Yes, my requests have a noble motivation—most of the time. And I strive to thank him for each answer he provides. Yet thanking God is not the same as praising God. Praise is largely missing in the time I spend with him. At least in the verbal sense. Yes, sometimes I sit in awe of his presence, and this is a form of praise. Perhaps it’s the best praise I can offer. Though sometimes I’m moved to praise God with words, I too often find that my vocabulary falls short. My words are inadequate or even nonexistent. And for a writer, not being able to find the right words is most frustrating. It’s easiest for me to praise God when I’m in the middle of his creation, far away from other people and our creations. It seems he’s all around me. My mind floods with an attitude of praise. Even though specific words evade me, it could be I’m praising him in my spirit. Though God may be worthy of my praise, fortunately my relationship to him isn’t contingent on me remembering to praise him every day. He loves me the same, regardless of what I do or don’t do. Even so, I can’t escape this feeling that when I neglect to praise him—the praise he is worthy of—that I’m letting him down. Maybe I’m letting me down. Susan, thank you for taking this journey with me!